Facebook announced that it was upping the environmental ante on Tuesday by committing to reduce its greenhouse gas emissions by 75% and power its global operations with 100% renewable energy by the end of 2020. It’s already been a big year for Facebook’s sustainability efforts, with the company signing several Power Purchase Agreements (PPA) to increase its total purchased renewable energy to over 3 gigawatts (GW) of solar and wind energy — including over 2.5 GW over the past 12 months. In March Facebook and Adobe signed PPAs for the electricity generated from the soon-to-be-completed 320 megawatts (MW) Rattlesnake Creek wind farm in Nebraska. In May, the company signed a 294 MW PPA with asset manager Luxcara and Swedish power company Vattenfall to secure the electricity generated from three wind farms located in southwest Norway to power the company’s Nordic data centers. 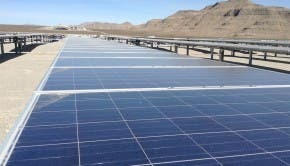 And in July, Facebook partnered with electric company Pacific Power to build 437 MW worth of new solar projects in Oregon that will power the company’s Prineville Data Center with 100% renewable energy. Earlier this month, Bloomberg New Energy Finance published new figures which showed that not only was Facebook leading the way in terms of corporate procurement — securing 1.1 GW worth of clean energy PPAs already this year — but that corporate procurement for the first half of 2018 had already surpassed procurement levels for the whole of 2017. It comes as little surprise, then, that Facebook is able to make such a ground-breaking commitment as transitioning to be powered entirely by renewable energy by 2020. Further, and importantly, each of the renewable energy projects Facebook is involved with are new and connected to the same grid as its data centers, which means that Facebook is investing directly into the communities around it, providing jobs and investment and a healthier environment. Instead of relying on renewable energy investments coupled with green energy certificates, Facebook has committed to supporting renewable energy development in ways that will best support local communities. “Due to the growing number of people joining the Facebook, Instagram and WhatsApp community and the use of new features like video and stories, we have had to grow our data center presence with six data centers announced in just the last 12 months,” said Bobby Hollis, Facebook’s Head of Global Energy. “This growth, and our strong commitment to renewable energy, has driven our strategy and procurement. In addition, we also worked hard with our key partners to enable renewable energy for our original data centers.